First of all, go to the old lump and put some grease between the front brake lever and the master piston, you will be surprised what that will do. If you want to keep the old caliper than take it off, take the seals out en put it in boiling water for a half an our or so, let it cool down and clean the seal groves with a Dremel with a copper brush on it. Also clean the holes for the pins on the adapter en put just a bit of silicone grease on the pins. Put some copper paste on the pin[s] where the pads go over. Well that makes a difference but if you want a real upgrade get the caliper the 1996 and younger models use. Does anyone know what brake setup this is, sorry about the bad photo. I know the setup isnt standard and that it nearly threw me over the handle bars once when a car slammed on the anchors in front causing me to break my right mirror. Ahhh thanks, that makes sense it being the stock caliper with a bracket to allow it to fit the larger rotor. I know the master cylinder is a bigger one so that is probably why the brakes are strong. I was worried about finding the brake pads for it you see but now I know that the oem ones should be ok. It's indeed the original pre 1996 caliper and the disc seems 300mm. Ow and a KTM LC4 old Adventure disc fits on our front wheel, you have to drill the holes for the bolt up to 8mm [ original 6mm] and use conical bolts. 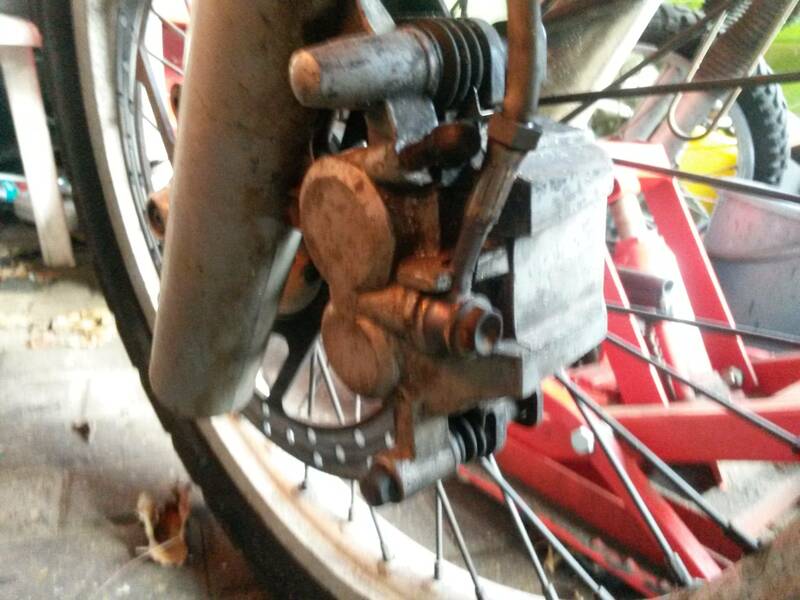 I changed the handbrake pump/main cylinder from the original 14 mm to a 12 mm from a Yam, also a DR 125 has a 1/2" which is plug and play. Makes a lot of difference and is very docile. 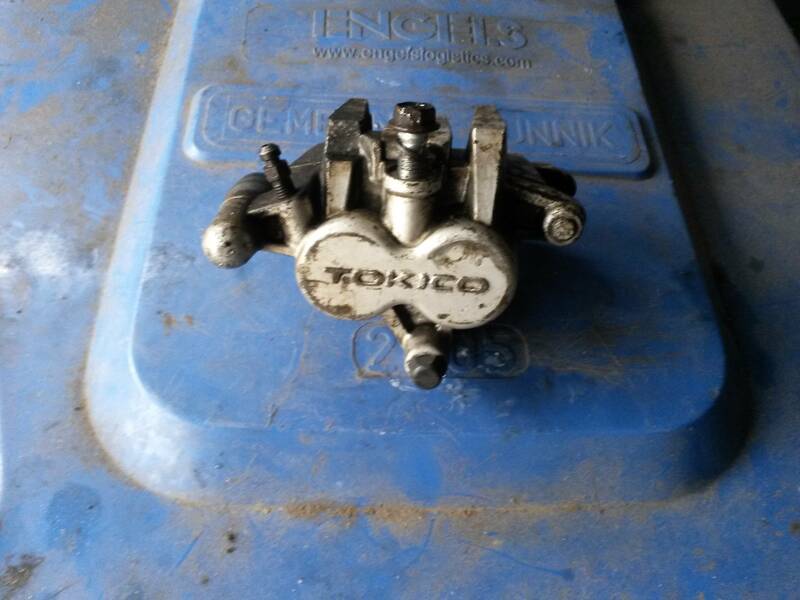 Now I have fitted brembo 11mm master cylinder (same used by ktm) with new brembo pads and it is even too powerful! Do not know yet how progressive it is. Thank you for the useful informations about the brake upgrade. 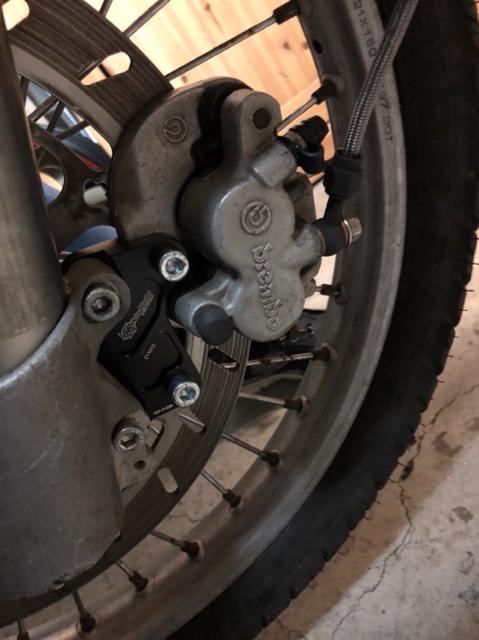 I founded a z750 lefy front caliper with his own adapter, the question is: is the kawasaki adapter valid for the DR 800 forks? Hard to say but the chances are that it just fits, you can just try it if you already have it and ask otherwise at what distance the mounting holes are if you have to buy it yet. Let us now if it fits or not.